This surprising and rare Indonesian pepper has a wonderful lemon flavor and is slightly numbing. This semi-cultivated pepper grows in one small region in the Cardamom Hills. Dense and heady, with a good pep and strong flavor. A unique Indian pepper, with a strong, lingering bite. Grown in the Kolli Malai hills in Tamil Nadu. A true classic. An early harvest and very dark black pepper with a bite. Perfect as an everyday table pepper. 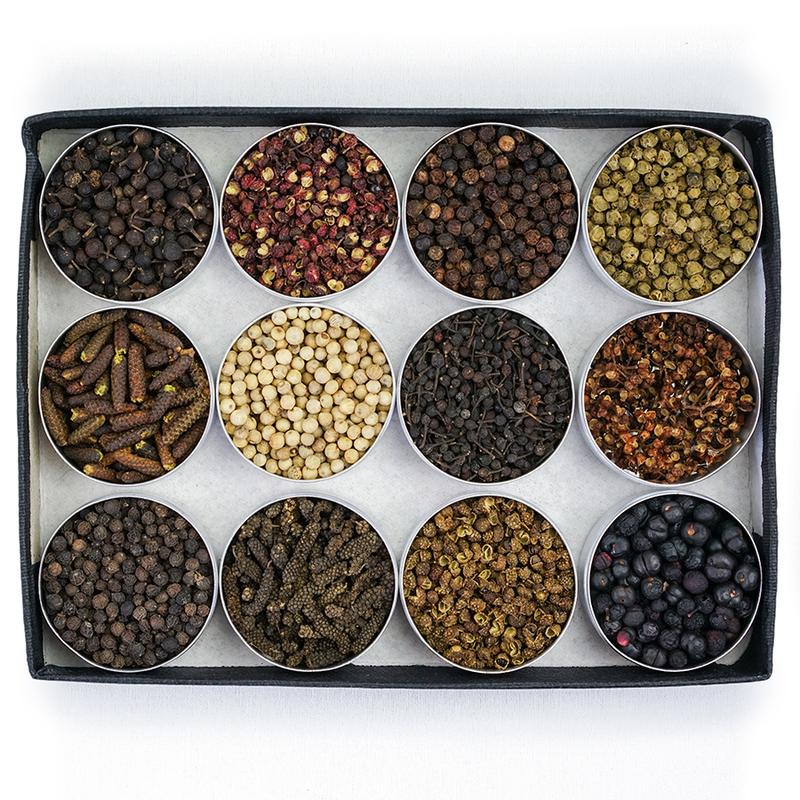 A Spice Trekker blend of different varieties of black pepper grown along the Malabar Coast. A perfect everyday Indian pepper blend for your mill. A pepper with a lasting flavour, harvested in the Cardamom Hills. Mlamala peppercorns are quite fruity and lively. A rare and aromatic pepper, with a remarkable longeur en bouche (a lingering pepper flavour that lasts). An exceptional pepper, lively and hot from the Indian state of Karnakata. This terroir gives the pepper a distinct and direct fragrance. Our Sri Lankan black pepper has a quick bite and a lingering aroma. We select only high density, early harvest berries deep black in color. Pure, flavorful, large berry Tellicherry pepper from India’s most respected black pepper terroirs. 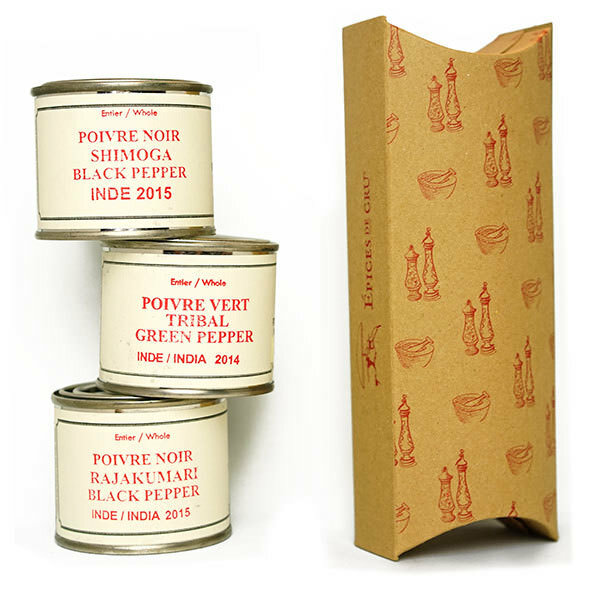 Pure, flavorful, large berry Tellicherry pepper from India’s most respected terroirs. The Épices de Cru Reserve is our most aromatic Tellicherry pepper. This semi-wild pepper is grown in the Tribal areas of Kerala, India. A small berry containing a hot pepper with a bite and a fresh taste. Our hottest black pepper! Fruity, lively and plenty peppery. Appreciated since antiquity for its mysterious aroma,cubeb goes well with red wine sauces, wild game and chocolate. A Spice Trekker blend and one of our best sellers. Very rich, flavorful and perfectly balanced. One of the ancient world’s most treasured spices- sophisticated, complex, and versatile. Experience this legendary cross between pepper and cardamom. A wild-foraged spice that is at once peppery and delicate. Rich and complex, with a strong floral side that verges on musky. Sustainably harvested in the wild by villagers near the Periyar Tiger Reserve in India. Fresh, young, and bright, for classic dishes or spice blends.